Children can be Safer in Homes with Firearms Thanks to This New High-Tech Gun Safe, Says Old Glory Safe Co.
SD7242 Gun Safe in St. Louis, MO. 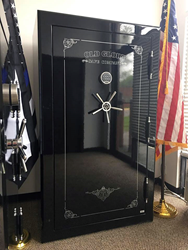 A recently introduced high-tech gun safe made of thicker steel and featuring additional built-in protections against uninvited access is believed to be the strongest deterrent now available for keeping firearms out of the hands of young children, Old Glory Safe Co. said in a statement issued today. Company officials said the new safe will help reduce the risks of injury and death to children who would otherwise accidentally stumble upon or determinedly acquire the handguns and rifles belonging to their parents. Old Glory Safe Co. noted that the National Rifle Association’s Institute for Legislative Action estimates some 350 million guns are in civilian hands across the country, and that guns are involved in the fatal shootings of 1.3 percent of all children in the U.S. The new safe—Old Glory Super-Duty BR—is designed to make it all but impossible for children to come into possession of the weapons stored within, said newly appointed national sales manager Thomas Craig. Craig explained that the “BR” in the safe’s name stands for battle-ready. Craig added that battle-ready also means burglars, when they try to attack the safe with crowbars and other tools, can expect to face a serious battle cracking it open. “And it’ll be a pretty much unwinnable battle for them,” he insisted. Craig said the Old Glory Super-Duty BR will give gun owners additional peace of mind with regard to another common worry—the survivability of stored firearms in the event of a fire. Along with thicker steel, the formidable Old Glory Super-Duty BR features a sag-proof double-step door, three-phase tactical lighting, and a state-of-the-art, no-fail digital lock that’s impervious to the effects of electromagnetic pulse (EMP) attacks, Craig said. According to Craig, the company decided to develop and manufacture the Old Glory Super-Duty BR in response to customer demand. “Our customers told us they wanted a thicker body, more pry resistance, and expanded lighting options,” he said. As part of an introductory promotion of the Old Glory Super-Duty BR, the safe is being offered for a limited time at a discount price to customers in the U.S. Craig said details of the offer are available at the company’s website: https://www.oldglorygunsafes.com/. Meanwhile, in his new role as Old Glory Safe Co.’s national sales manager, Craig said he will work to find new and better ways of getting gun safes like the Old Glory Super-Duty BR into the hands of more gun owners. A passionate supporter of Second Amendment rights, Craig said he believes gun safety measures—such as gun safes and educational programs—are vastly more helpful than gun-control legislation in ensuring responsible use of firearms. Craig started with the company as a salesman, Old Glory Safe Co. spokesman Andrew Van Pelt reported. About Old Glory Safe Co.
St. Louis, Missouri,-based Old Glory Safe Co. designs, engineers, builds, distributes, and sells state-of-the-art gun safes nationwide. The company’s products are intended to prevent stored firearms from being stolen or damaged but without hampering the owner’s ability to gain lightning-fast, easy access to them in an emergency and, particularly, in darkened rooms. Founded in 2010, Old Glory Safe Co. is noted for its backlit, failure-proofed digital locks, no-sag doors, free-shipping policy, lifetime warranties (which cover everything, including the lock), round-the-clock customer service, and 12-month zero-percent financing.